View Work Trips 2008 on GregW's travel map. When one thinks of Texas, one thinks of heat, of dusty desert landscapes upon which tumbleweed rolls along. 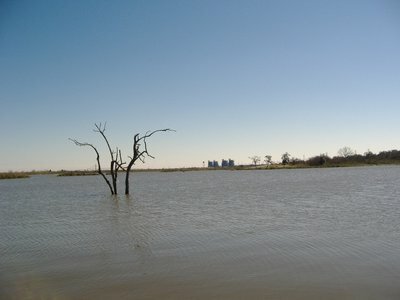 Texas is a big place, though, and Houston offers a tree-filled view, a lush river delta leading into the Gulf of Mexico. However, with a latitude of 29 degrees north, 45 minutes, a latitude further south than Cairo, Egypt, one would expect Houston, Texas to be warm, even in the January. In fact, average temperatures for Houston in January tend to be in the high teens Celsius. That is why it was so surprising that the weekend I choose to tour the city, Houston would be experiencing a high of 10 Celsius. Unprepared for the cool weather, I had to wander down to a Target store and buy myself a sweater. Local Houstonians were wandering around in heavy jackets with scarves and gloves. Decked out in my new sweater, providing one of the 4 layers I was wearing, I headed out from my Hotel near the Galleria on the west side of Houston, and headed East towards San Jacinto Bay. 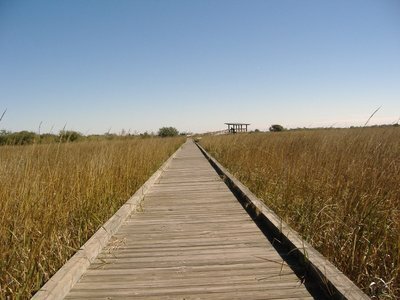 The battlefield at San Jacinto, near the San Jacinto River and San Jacinto Bay, was the site of a very important battle in 1836 that gained Texas their independence from Mexico. In the 1800s, Mexico stretched from Columbia (modern day Panama) in the south to a northern border that included parts (or whole pieces) of California, Nevada, Arizona, New Mexico, Colorado, Utah and Texas. Mexico gain independence from Spain in the early 1800s during the Mexican war of Independence, and soon that large swath of land found itself under the control of president General Antonio López de Santa Anna (a man who would hold that office a total of 11 different times over a 22 year period). In 1835, Texas declared independence from Mexico, forming the Republic of Texas. Santa Anna was not impressed, and soon dispatched troops to bring Texas back under Mexican control. Santa Anna swept up into Texas, defeating Texan troops at the The Alamo in San Antonio and later at Goliad. General Sam Houston, on the Texans side, retreated his troops from Santa Anna’s advance. Santa Anna, feeling confident, divided his troops into multiple columns to pursue both Houston and the Texan government. This gave Houston his opportunity, and Houston set up camp on a point of land where the Buffalo Bayou met the San Jacinto River. On April 21st, Houston attacked the Mexican camp, with a regiment of troops lead by Sidney Sherman advancing from the northern tree line, and the main bulk of the army coming up from the south. The Mexicans, unprepared that day for battle, retreated to the east, where they were cornered. 600 Mexican soldiers died that day with a loss of only nine Texans. Santa Anna was captured the next day, April 22nd, 1836, and forced to sign a treaty giving Texas it’s independence from Mexico. Texas’ independence was short-lived, however, and a few years later they joined the USA. Following the defeat by the Texans, much of the rest of Northern part of the Mexico fell during the Mexican-American war. In 1848, the Treaty of Guadalupe Hidalgo ceded to the United States approximately 1/3 of the present area of the USA, including in whole or in part the present-day states New Mexico, Arizona, Nevada, California, Utah and parts of Colorado, Wyoming, Kansas and Oklahoma. 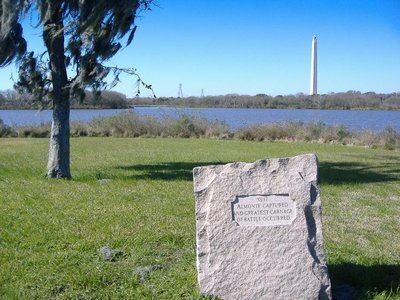 The point where the battle took place is now a state park with a large monument to the battle and the Texans victory over the Mexicans. The Art Deco obelisk is the tallest free-standing column in the world at 570 feet tall, 15 feet taller than the Washington Monument. Leave it to the Texans to outdo even their own government. In addition, a number of boulders are scattered around the grounds where important parts of the battle took place, including the spot where the majority of the 600 dead met their ends. Speaking of Clear Lake, that was my next destination, to the south of the San Jacinto Park. Clear Lake is a pleasure boaters destination, with from 19 marinas and over 7,000 boat slips in Clear Lake area, the third largest concentration of pleasure boats in the United States, apparently. My reason for going to Clear Lake was not to go boating (a little cold to be out on the open water this past weekend). 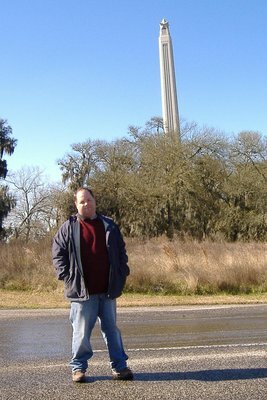 Rather I was there to head north from Clear Lake and back over the city boundary into Houston and NASA’s Lyndon B. Johnson Space Center, which sits just over the border from Clear Lake in Houston. 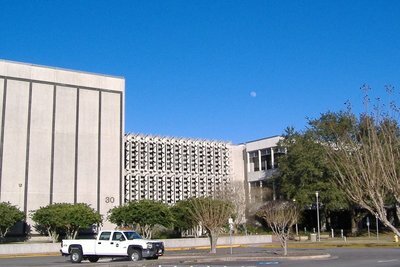 The Johnson Space Center is mission control for all American Space Shuttle missions, activities aboard the International Space Station, and is the training facility for all American astronauts. No rockets or space shuttles take off from Houston (for the most part, that happens in Florida at the Kennedy Space Center). The control facility in Houston is separated from the launch facilities in the event that a disaster occurs (rocket explosion or what have you) to ensure that you don’t lose both facilities. The visitors’ center at Johnson Space Center has an interactive museum which would probably be fun for kids, but I found a little dull. I did, however, quite enjoy the opportunity to do the NASA tour, where a tram takes you around the grounds of Johnson Space Center. We saw one of the three mission control rooms in the facility, the training center where astronauts train and a few rockets and rocket engines from past programs like Saturn and Apollo. 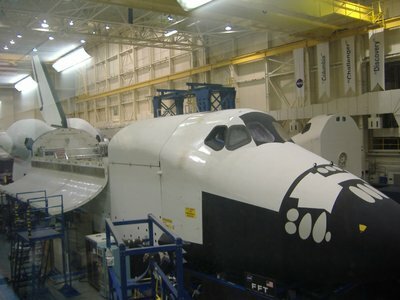 The training area was interesting, as it included full size training models of the shuttle and International Space station, a couple of shuttle flight simulators and two models of the Canadarm, the robotic arm made by Spar Aerospace in Canada. Yay Canada! To simulate using the arm in a zero-g environment, the astronauts train by pushing around balloons and other light weight objects with the robot arm. In addition to controlling missions and training astronauts, the Johnson Space Center is also home to the development programs for the next generation of space travel, which includes new space craft, a lunar base and a trip to Mars. In addition to the over 17,000 full time and contract employees working at the Johnson Space Center, there are more than 70 aerospace firms in the Houston area. The Bay Area (as the area around the Johnson Space Center complex is called) Bay Area Houston is home to 92 percent of Houston's aerospace jobs and 4.5 percent of Houston's total employment. As the tour group was leaving building 30, where the mission control rooms are located, the guide motioned up to a flag atop the building. 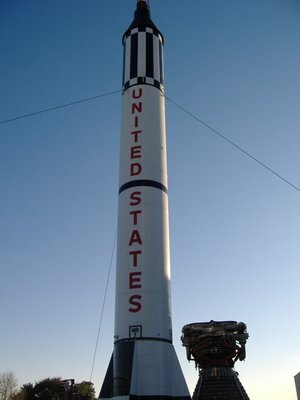 “Whenever an American is in space, the American flag flies on that pole. As there is an American at the International Space Station, the flag is flying at this point.” Looking up to the flag pole, I noticed off to the right that the moon was rising in the blue sky over the building. There it was, NASA’s next destination, the moon, just above the horizon, so close and yet actually 380,000 kilometers away. 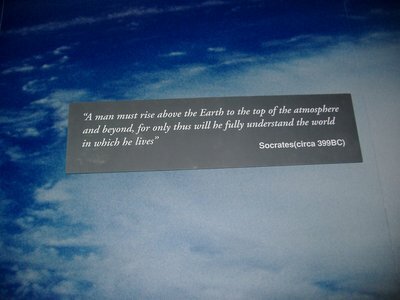 Houston is right there, at the edge of space. Due to its important place in the Aerospace industry, Houston’s NBA team is called the Rockets, though I learned while attending a game last Wednesday that originally the team was from San Diego. In San Diego, the team was also called the Rockets, in honour of that city’s large aerospace industry. Luckily for the NBA, the Rockets moved from one capital of aerospace to another. After moving from Minneapolis to Los Angeles, the Lakers of the NBA never changed their name, even though there isn’t much in the way of lakes around the Los Angeles area. Heading south from NASA down highway 146, I noticed that my gas gauge was getting low, so I pulled off the highway in Texas City to fill up. Buying gas in Texas City, besides for being a practical concern of not running out of fuel, was also a strong metaphor. I recently read the outstanding book The World Without Us by Alan Weisman, in which the author examines the question, “If somehow the earth were depopulated of humans overnight, how long before all trace of humankind vanished?” In the book, the author spends a chapter in the Houston area, and specifically Texas City, to examine what would happen to all the petrochemical processing plants that we have created. Why associate the petrochemical industry with the Houston Area? As the interesting article on the Houston Ship Channel called Amidst a Petrochemical Wonderland: Points of view along the Houston Ship Channel points out, approximately one quarter of the refining capacity of the United States is located along the ship channel, at over 20 petrochemical plants in the channel area. They are linked by pipelines, selling streams of liquid product to one another, and bringing in crude from hundreds of platforms in the Gulf, as well as heavier, cheaper crude from Mexico. Texas City, south of Houston, is home to three refineries: Valero, Marathon Ashland Petroleum LLC, and British Petroleum (BP). The BP refinery can process over 450,000 barrels per day, making it the third largest refinery in the USA. In addition to the refineries, there are a number of other petrochemical plants that use all that refined oil to make a number of products. With all those petrochemical plants, Texas City has from time to time, blown up. The most significant of these, known as the Texas City Disaster, happened in 1947, when a fire aboard the French ship Grandcamp ignited the 2,300 tons of ammonium nitrate (fertilizer) aboard, causing the ship to explode. The resulting set of fires and explosions through-out Texas City killed more than 500 people and wounded over 5,000. I left the gas station just as the sun was sinking in the sky, and drove through town and past the chemical plants. The lights on the pipes, stacks and processing equipment were just coming on. Looking at this stainless steel maze light up against the blackening sky, with spouts of fire shooting in bright orange and cool blue flames from venting stacks, I couldn’t decide if the scene reminded me more of a post-apocalyptic landscape ala Mad Max, or a futuristic city like something from a Japanese manga cartoon. Apoligies for the poor singing, and the fact that my words get cut off at the end. I am a poor host and videographer, apparently. I was saying, before I apparently hit the stop button to quickly, "Welcome to Texas City, the gas station of America." 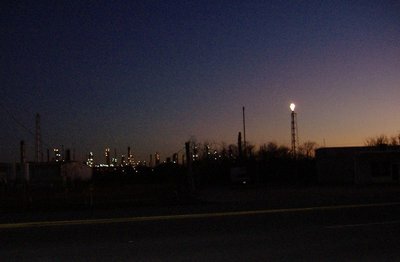 Later that evening, when driving north back towards Houston from Galveston on highway 45, looking at the row of petrochemical plants in the distance definitely put me in mind of that futuristic city. From across the water of Galveston Bay, it looked like a very distant city of skyscrapers, all lit up with shiny glass. It’s truly an impressive site, though once you get closer to the Texas City industrial complex, the vision of future cities fades into the stink of chemical processing. But prior to heading back to Houston, I drove further south to Galveston. Galveston sits on an island in the Gulf of Mexico, and is now probably best known as a town with a number of tourist attractions. Back in the late 1800s, however, Galveston was the biggest city in the area, surpassing even Houston. However, in 1900 a hurricane struck the area, killing between six and eight thousand people and destroying a good chunk of the city. After that, many of the residents and businesses moved north towards Houston, and the city never really recovered. One can’t help but draw parallels between Galveston and New Orleans, and wonder if Galveston is a glimpse into New Orleans’ future. I didn’t see too much of Galveston though, as I arrived pretty late in the day and needed to head back to Houston that evening. I took a quick drive around the historic Strand district, and then headed to a restaurant for dinner. It was a busy night in Galveston, and I had to wait for a table. Soon my name was called, and I was shown my table, overlooking the the tall ship Elissa. 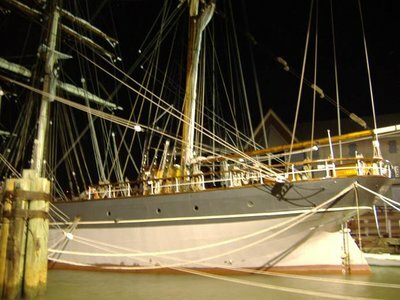 Launched in 1877, the Elissa was restored in the 1970s. 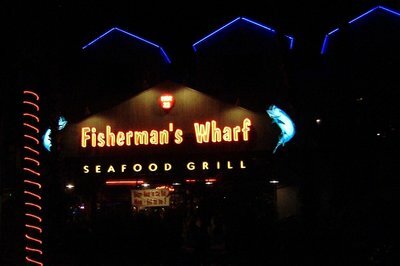 As I was at a restaurant called the Fisherman’s Wharf, I figured I should get seafood, and as I was just steps from the Gulf of Mexico, I decided on an entry with three different preparations of Gulf Shrimp. 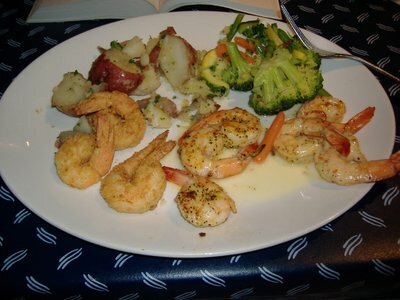 The shrimp are caught wild in the Gulf of Mexico, where they live. For all I know, the shrimp could have been caught by Forrest Gump and Lieutenant Dan. Who can say? I finished up with dinner, and soon was back on the road, heading north along highway 45 back to Houston and my hotel room. The day started with the history of San Jacinto and ended with the historic center of Galveston, and in the middle featured space travel and the futuristic landscape of the petrochemical alley. Yesterday, today and tomorrow all in one day.